Home / Camscanner Blog / CamScanner makes tax season so much easier! Tax season can be a hassle even if you’ve hired a tax preparer. It’s a huge task to collect and organize all those tax-related documents at one time. However, the disaster can be avoided by proper preparation. And that’s why we have to share the following tips with you. The most efficient way to make tax filing less of a hassle is to go PAPERLESS, so that you don’t need to dig out all those receipts, bank statements, bills before filling out tax forms. Open CamScanner and take a picture of any receipts or bills after every expense, it simply takes 3 seconds but will save you tons of time during tax season. Use the B&W mode to enhance scans so that the texts are clear and easy to read. A mix-up of different finances can make everything in a mess and even lead to legal issues. 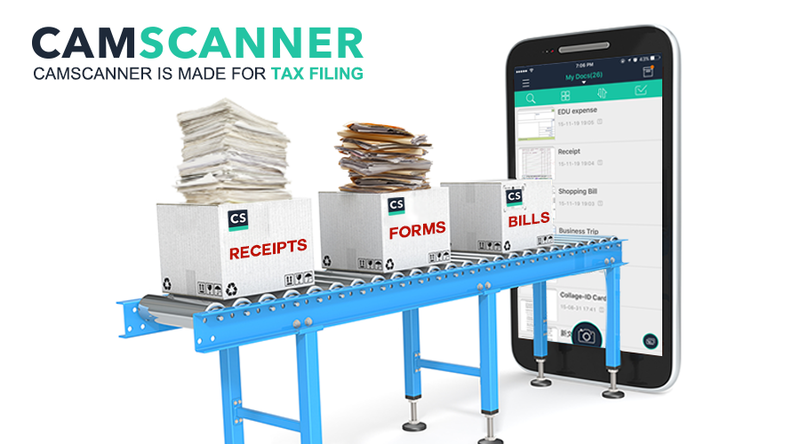 By digitizing all the paper docs with CamScanner, it becomes extremely easy to group and organize different kinds of tax-related docs. Add tags like “Business Trip”, “Invest”, “Payroll”, “Educational Expense” and more to group all the financial documents you scanned. This might be the most secure way to avoid document loss. Register a CamScanner account and all docs can be synced to the cloud, so you can access all of them on phone, tablet and computer. Furthermore, it keeps all your docs updated throughout the year. In addition, you can scan your previous tax-related documents and label them with tag like “tax return 2014” and save in CamScanner cloud, in order to have a clean record of everything. Tap the document you’d like to share with your tax preparer. Tap the Invite button to invite them to view the docs, and they’ll have the “read-only” access to all the information. Alternatively, you can convert the documents into JPG or PDF version, and send to him or her via email. Everything will become unprecedentedly easy. Feel like that CamScanner is made for tax filing? Get started to scan the first receipt now! Don’t have CamScanner yet? INSTALL HERE!